Over a 20+ year career I have also undertaken lots of further professional development. Senior Accreditation with the British Association for Counselling and Psychotherapy is an endorsement of my many years of experience. 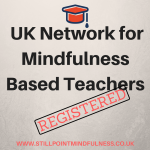 I am registered with the UK Network for Mindfulness Based Teachers which is a voluntary collective of mindfulness training providers formed to ensure that people who wish to learn mindfulness can find a properly trained and qualified practitioner. To gain registration with this body I had to demonstrate an appropriate level of training, experience, ongoing supervision of my work, and that I am insured, undertake continuing professional development and have my own established mindfulness practice.